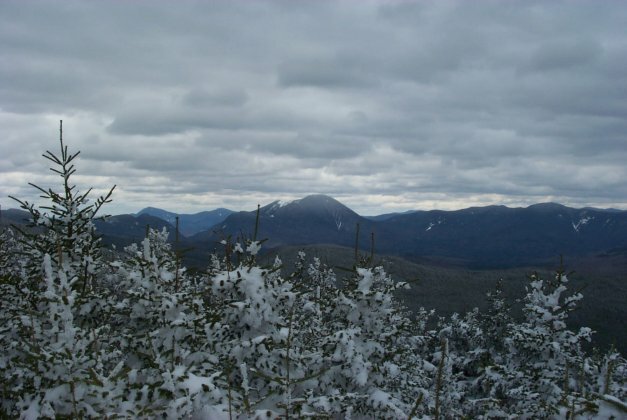 Although I have done many hikes in the Spring, Summer and Fall I've typically shied away from Winter hikes, just because they require a little more preparation and planning. Like most people, I don't want to have to work too hard to do something I enjoy. But when the opportunity came up, I simply had to give it a shot. 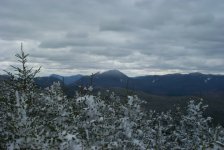 And I would be lying if I didn't say the posts on the forum were really psyching me up for Winter hike! It all started when some of my buddies hatched a plan to have a boys weekend in Twin Mountain. The idea was to play poker and generally have a fun, relaxing weekend without too much responsibility, too many decisions, and if by chance we accidentally drank a few beers well then so be it. Of course Twin Mountain is very close to many great hikes, so I thought it was the perfect opportunity to hike a peak I've wanted to hit for a while: Mt. Eisenhower via Edmands Path. But as soon as I got to the Mt. Clinton Road my concerns were confirmed, it was still closed. So I drove another 100 ft. down Rt. 302 and parked in the lot near the old train station at the Crawford Depot and went with Plan B: Mt. Tom. Several other cars were in the parking area, and I watched four hikers who were probably in their early twenties gather up their daypacks and hit the trail. I didn't see any sign of crampons or other traction devices, and wondered how far they were going to get. And of course the car next to me had three older guys putting on their boots, wearing jeans and sweatshirts. Luckily, I had checked the forecast and no precipitation was predicted, so I figured they wouldn't get too wet. At around 10:45 (remember; poker, beer, buddies? That mix means leaving a little late) I left the parking area wearing medium weight thermals, nylon hiking pants, a wicking t-shirt and my fleece. I had packed my GoreTex shell, rain pants, another wicking t-shirt, a wicking long sleeve shirt, a hat, two types of gloves, food and water. 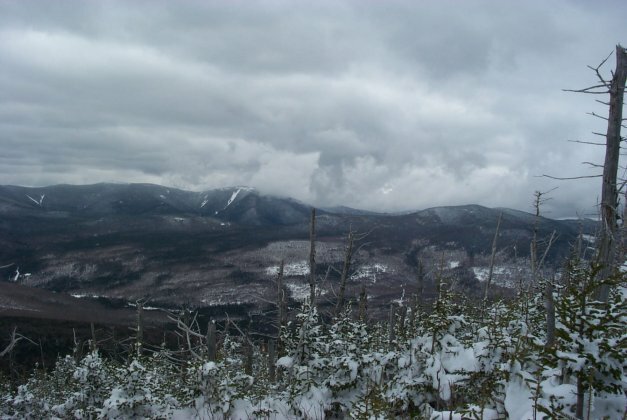 After crossing the railroad tracks just outside the parking lot, I began my first Winter 4,000 footer. As with most hikes in the Whites, this trail starts off very gradually. The Avalon Trail is fairly wide at the beginning and although there was little snow on the ground around the area, the trail was pretty well packed with snow from the beginning. Although I had a brand new pair of crampons, but I decided to wait to put them on so I could get a feel for the trail with bare boots first. Footing was a little slippery, but not too bad. 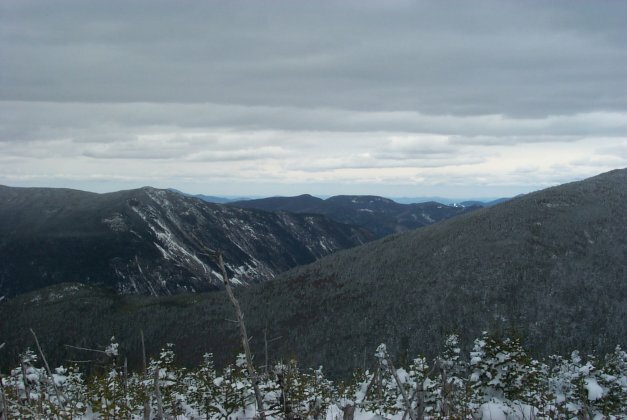 Within the fist 100 yards, the Avalon Trail intersects with the Mt. Willard Trail, which ascends obviously enough to Mt. Willard at 2865 feet. As it turns out, most of the people in the parking lot were headed there. After stopping briefly at the sign post here, I moved on and got underway up the Avalon Trail. The grade stayed steady through the lower section, which allowed me to warm up my muscles and stretch a little. Before too long, a crossed the first brook (mostly frozen, but it looked like it would provide reliable water in the warmer months) and soon after I noticed a slight spur trail that indicated the Beecher and Pearl Cascades. I made a mental note to check these out on the return trip; a quick look at the map told me that this sidebar would be less than 0.1 mile out of the way, but I wanted to get going. The Avalon Trail continued gradually from the Cascades, and before getting too much further I met a group of three headed to the Zealand Hut. They were already using their crampons, so I took the opportunity to ask them their thoughts and opinions. I would be leapfrogging these friendly guys for most of my journey, and that made the trip a little more interesting since I was hiking alone. 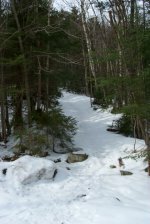 At almost a mile, I re-crossed the brook, and the trail began to narrow and climb a little more steeply. Not having my crampons on yet made the climb a little tougher, and by the time I reached the junction of the A-Z Trail, I was convinced it was time to put them on. 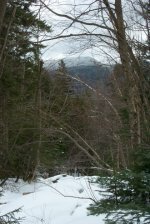 I spent about five minutes getting the crampons secured to my boots, took the right turn onto the A-Z Trail and began the second half of the hike. It took only two minutes before I was really glad I put those crampons on! 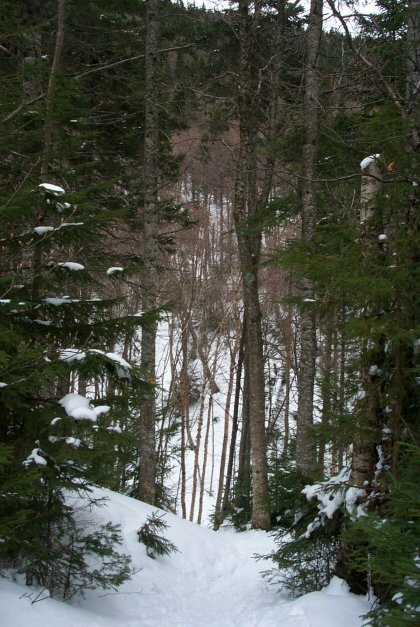 About 100 feet up the A-Z, the trail descends a very steep slope into a gulley carved by the Crawford Brook. Without crampons, I would have ended up sliding down this gulley on my posterior like someone had obviously done before me. The trail drops about 40 feet into down to the brook then immediately climbs back up the other side. Although I hate losing altitude that I've already hiked, this gulley was a beautiful little area, so I wasn't too upset. At about this point, the snow began to lose that wet feeling and felt much more like powder. 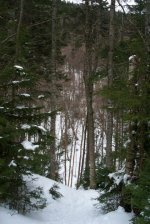 Once across the Crawford Brook, the trail continues to increase slightly in grade. 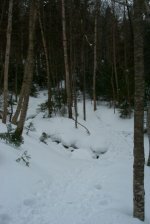 Footing was excellent with the crampons, which I had already gotten used to. The A-Z Trail follows the side of the valley that the brook created affording some really interesting views. I had a tough time capturing the beauty with my camera, but it was very alluring sight with the snow in the trees. 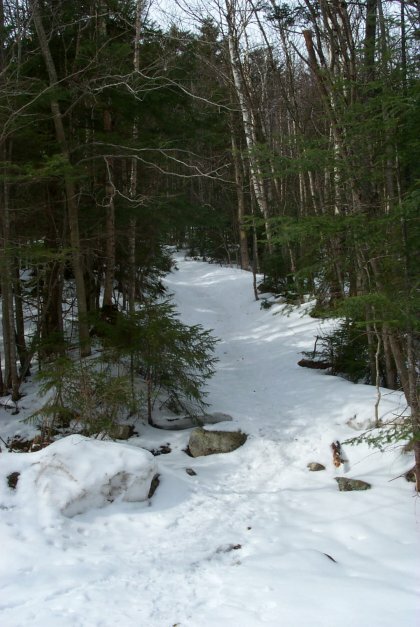 At about � mile, the A-Z crosses the brook and begins a much steeper grade. I was taking frequent breaks at this point because one of the great benefits of hiking solo is that you can move at your own pace without slowing anyone else down; the steepness of the trail combined with my lack of sleep and mild hangover forced me to take in more of the beauty around me concentrate less on what kind of time I was making. At some point I decided that I'm really starting to enjoy the environment of my hikes, and this one had some really beautiful things to see. As I got closer to the junction of the Mt. 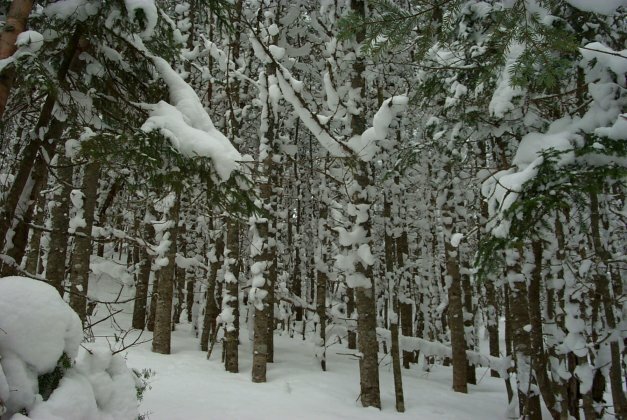 Tom spur, the snow somehow seemed to have fallen through the canopy and accumulated in every nook of every tree. This made the trail atmosphere almost surreal and I quickly felt the familiar love of snow I've had since I was a kid. 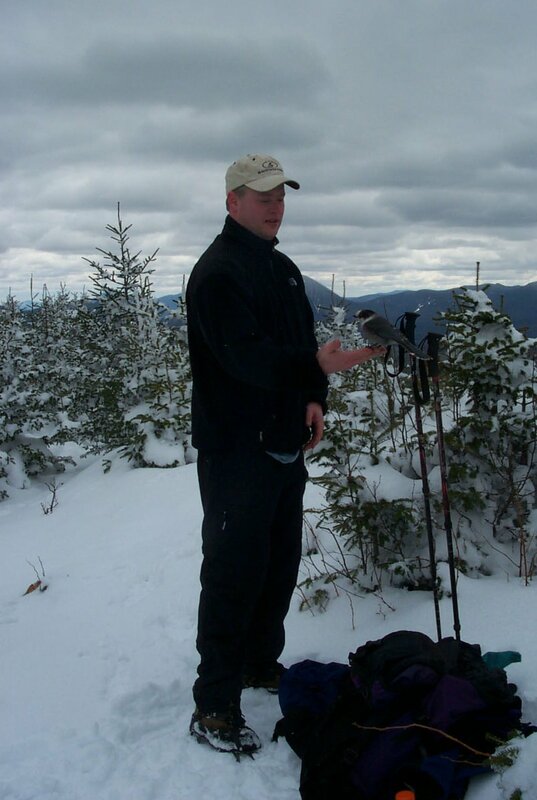 It was about this point that I decided that I will be taking many more Winter hikes! At one mile past the junction of the Avalon trail, the A-Z meets the Mt. Tom Spur in a thick saddle of pine trees. The sign tells no one in particular that the summit is � mile away, to the north. I followed the spur which immediately starts a series of quick turns through a narrow passage at a very moderate grade. Looking around, I almost felt like I was in a movie. The snow had fallen and collected on the trees in such a way that I felt like I was walking through a snow tunnel. It was really invigorating and I pushed on. At about .2 mile the trail steepens and begins its final push towards the summit. Winding through more of the same, the spur reaches a false summit less than .1 mile from the real summit. Some great views to the southeast can be found here, and I took the opportunity to grab some quick pictures. I kept moving and quickly reached a blow down where I met two Canadian Jays (I think) who were very interested in me. I had heard that these birds are very comfortable with people, so I took a couple shots of them. I quickly learned that they are almost totally unafraid of people, as one of them landed on my hiking pole! Although I was enjoying my new buddies, I turned to complete the last 100 yards or so to the summit. 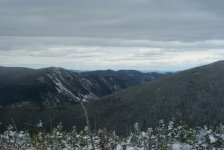 Despite the openness of the summit, many of the trees and much of the snow were still there. As I approached the summit cairn, I felt that amazing feeling I always get when I reach the top of a beautiful mountain and truly enjoyed reaching my first Winter 4,000 footer. Time to reach the summit was about two hours � 15 minutes. Despite the many cars in the parking lot, there were only two people on the summit (I later learned their names, Glen and Patty). We shared some conversation as I grabbed a bite to eat and soaked in the views. The jays had followed me to the summit and were looking for food. I wanted to see if they would land on my hand if I offered them some PowerBar, and sure enough these guys swooped right in and landed on my hand. It was amazing how calm they were! After about 30 minutes on the summit, I decided to head back down. My new friends were waiting for some of their hiking group, so I descended solo, back the way I came. 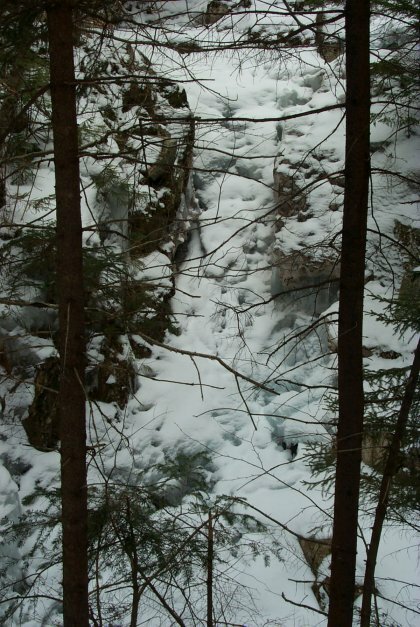 As planned, I made a quick stop at the Beecher and Pearl Cascades, which were mostly frozen. It was pretty cool to hear the water rushing under a solid cap of ice, and I enjoyed the little side trip. I imagine in the warmer months, this is a beautiful place to stop. An uneventful hour after I left the summit I was back at my truck, thinking about what an amazing hike it had been. The views, the scenery and the wildlife were all spectacular. Although Mt. Tom is one of the shorter 4,000 footers it has some incredible features and personality. During the summer months I'm sure there is equal beauty and I may have to find out for myself. I highly recommend this one to anyone, even those who haven't hiked in a while.